NB: The "Bubble" Section, refers to the large spherical Primary hull of an Olympic class vessel The Olympic-class starships are medical vessels used by Starfleet as early as the 2370's. The Olympic has a spherical primary hull like the Daedalus-class. Their defensive systems were not designed for combat, and are poorly armed. They have 27 decks, The main shuttlebay is located at the aft of the ship. It's navigational deflector array is located at the lower-half of the spherical hull. 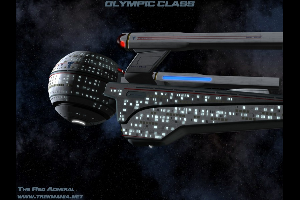 The Olympic Class was designed and entered service in the late 2370's. Built by Starfleet primarily as a hospital ship, the class featured an spherical fore-section (Much like it's predecessor, the Hope Class) which allowed a more even distrubution of medical facilities and patient care than was possible with more traditional saucer configurations. The engineering section housed most of the crew and resident medical staff. The Olympic Class engines were capable of speeds approaching the fastest ships in the fleet. The battle of Wolf 359, the Dominion War, and several "Isolated Incidents" during peacetime pointed out the mistakes made with the Hope Class, that not everyone out there respected "Humanitarian" efforts against attack. The Hope's limited shielding and armament only made her a prime target, not just tactically during war, but against raiders in peacetime. So using a very similar space frame to the Hope Class, along with newer technologies, the Olympic Class was created with fixing these limitations in mind. The decision was made to stay with the same spherical primary hull design because it provided optimal support for various humanitarian emergencies, the Hope's massive hangar was replaced with a thru-deck version to enable the use of the recently developed Serenity Modular Transports as well. While as fully equipped and staffed as a hospital, it is not usually intended for long-term stays. In the event for the need for continued care or convalesence, patients are usually transferred to other facilities. Page Rendered in: 0.04 seconds.